Cool! I wonder if this will see play in Quest Hunter in wild. It's king of like a Hobgoblin for this set. I think this seems really worthwhile. This is a little scary actually ... That will go along with every token/aggro/zoo decks. This work on tokens, like Raf’s Scheme? If so good for token lock. No it says "play", not "summon"
I find this card very flavourful. The rush part symbolises how the character floats in the air. This would have been good in quest hunter, maybe this is the missing link, sadly the archtype rotates out to wild. 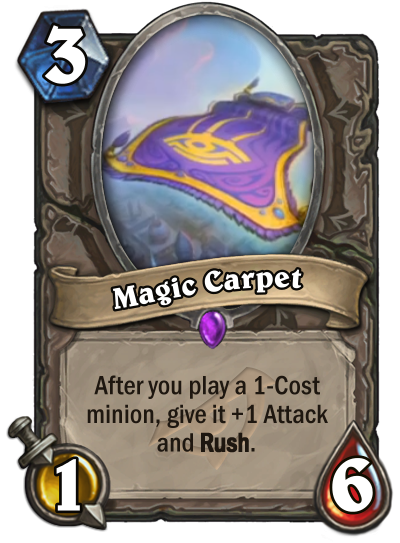 As for board flooding decks - it's alright I guess, but you have to include a lot of 1-drops. The card states "after you play". This card is very scary to me. Especially in decks that really want to synergize with the new Lackey generators. I think this is way too situational, you need a very good draw engine to stick a lot of 1 drops into the deck and make use of this card and 1 attack pretty much does nothing tempo wise. Perhaps something like a Life Tap? A Whole New World for aggro decks! I can confirm that it will synergyze with Spirit of the Rhino so all cards that you play when its on board have immune. Acornbearer approves! Holy hell this is horror in token druid lol its the NUTS literally! Reminds me a little bit of Hobgoblin, and it might even be a slight bit stronger, thanks to 6 health. Perhaps a good card for Zoolock. A deck running a lot of 1 drops isnt necessarily a deck that wants a lot of rush trades.